This method allows you to flow with your emotions in the moment to get from any emotional state to another one. What do I mean by “expressing your emotions”? Draw, sing, paint, or dance your feelings! Let them out in some form or fashion. Why does this help? When you feel stuck, in a rut, down, frustrated or any other state you might not enjoy, you can flow from one state to another by expressing it. And it’s not random, or an arbitrary decision to go to a state of, for example, “happiness”. Instead, you get to your next state by letting your current state flow – which means that your awareness of that state becomes a part of your next state – so you gain a greater intuitive understanding of what’s bothering you while getting to an emotional state that feels better to be in. That doesn’t mean the root cause has been totally solved, but it certainly helps get you closer to the solution. Use this method to get an immediate and vibrant effect on your whole inner being. My favorite method is to sing it out. I just sing whatever I’m feeling. And keep in mind: I’m not singing to put on a show, I’m singing to better understand my feelings. So that means that anything that seems silly or strange or “not like music at all” might be the kind of stuff that comes out of you. Let yourself be surprised, sing your embarrassment, your mental hangups, everything that you can feel. Just like music you listen to makes you feel a certain way, your feelings can be expressed as music. This might be why when one is feeling sad, one often picks sad songs to listen to. Another way is to draw it out. Take out a sheet of paper and pen or pencil, and start drawing what you feel. 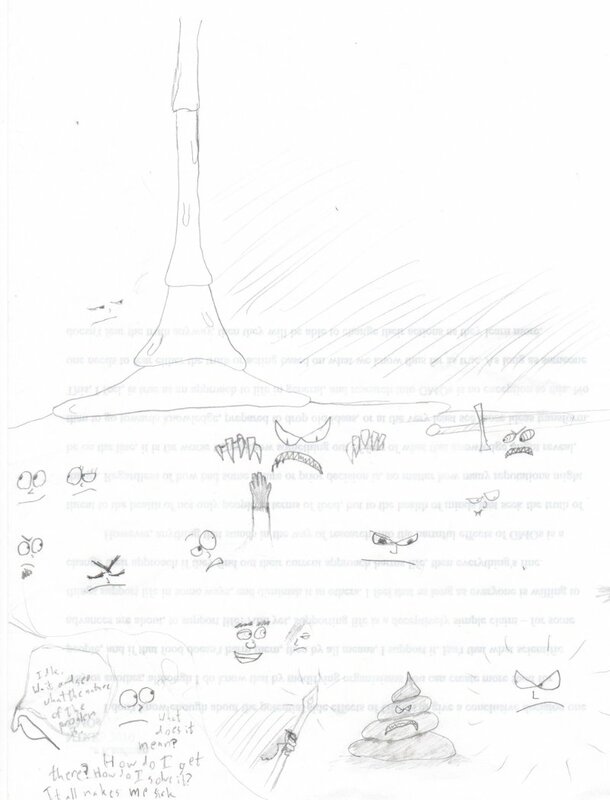 It could be faces, flowing lines, angry fanged demons, stick figures fighting it out, a landscape – anything. Just draw how you feel right now. This can help you to better understand what’s bothering you, and perhaps put you in a thoughtful mood. Sometimes, you might find yourself drawing a silent story as your feelings change. At the end, maybe you’ll feel joy, or a weight lifted off your shoulders. Click here for an example from a night I felt bad inside but didn’t know why. Ways I DO NOT recommend: hitting pillows, cutting yourself, yelling at your neighbor, kicking your dog, kicking your neighbor’s dog, or jumping into a giant tub of crabs just to express your pain. The main point is: please don’t harm yourself or others. It may use up your energy and get you into another emotional state, but the price is tremendous. You’re already in pain, don’t go creating more. Instead, buy a straight jacket and sing your way out. Or paint your way out. Draw evil little demons sticking spears into you. There are many ways to express pain that allow you to better understand it. Simply letting it guide destructive impulses won’t help. Now, if you’re reading this and think: “Damn it! He’s right! My destructive actions HAVE caused so much harm! I’m a terrible person….”, remember this: at the time, whatever you may have done seemed right. Maybe that’s the only way you knew how to get out of your pain. But now you’re learning new tools to get out of it, ones better suited for the job, and learning is part of life. You can learn more tools. So be fair with yourself. You’re still alive and able to make new decisions based on new information.